The Albin Polasek Museum located in Winter Park is currently hosting a showing of works by Central Florida artists titled “Captured In Paint”. The showing will run from September 12the through December 3rd and includes several works by Pettegrew. The showing is of the collection of Hal Stringer and Kevin Miller. 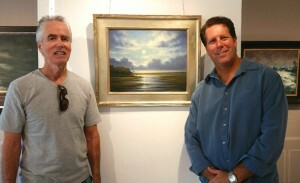 Pictured is Peter Pettegrew with collector Kevin Miller.